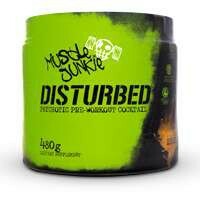 Muscle Junkie Freak is a delicious high-calorie nutrition shake for increasing weight and muscle. To start increasing weight athletes consume more calories then they burn and do this by eating a lot of food. If eating large amounts of food is difficult, a mass gainer helps you to reach your daily calorie needs with a delicious tasting shake. 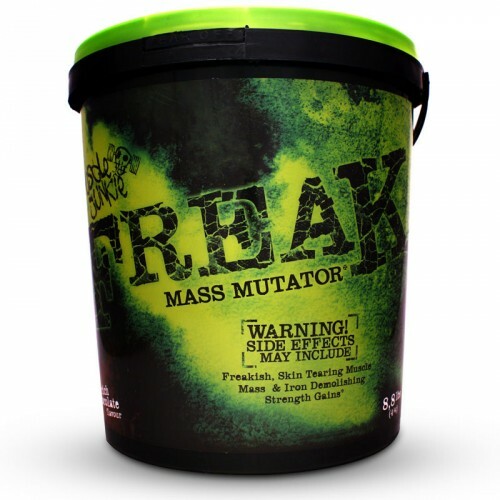 Each serving of Freak will give you a massive 768 calories which is the same as 2 chicken burgers and chips! At the time of this review each serving of this shake will cost you R19.45. The average price for 2 chicken burger and chips is R80. That’s a saving of R60.55! 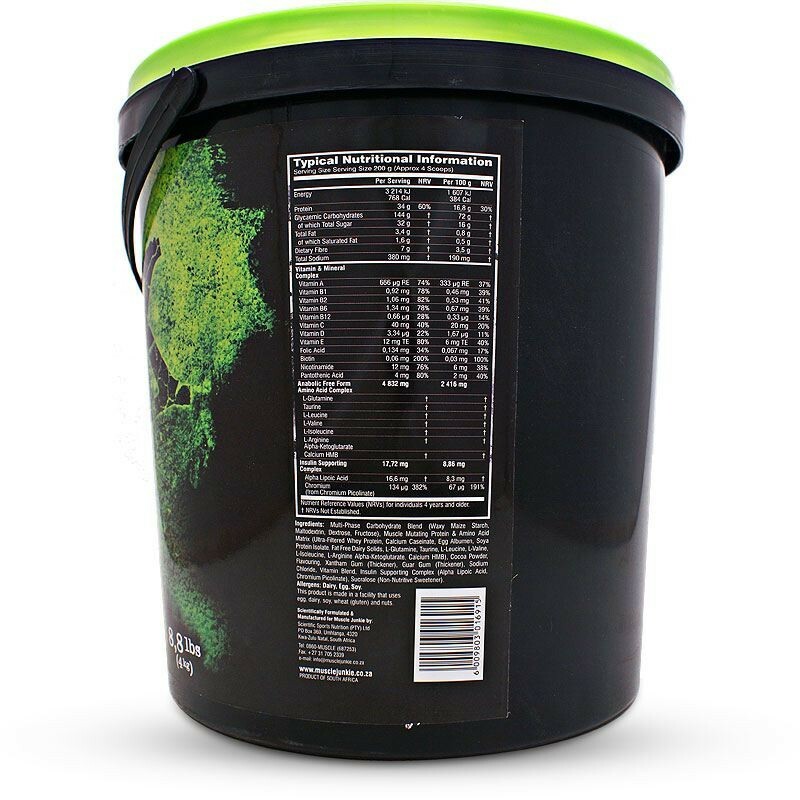 Not only will this product start to increase your weight, every 4 scoops provide 34 grams of quality protein to feed your body for muscle gains. Your body uses protein sources differently. 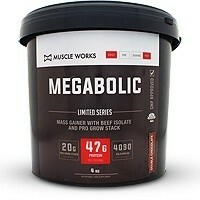 To ensure that you get the maximum benefit from each the manufacturers have included protein from 5 sources. As this is used to supplement your whole-food intake vitamins have been added to give you additional micronutrient support and a well rounded nutritional profile to the product. 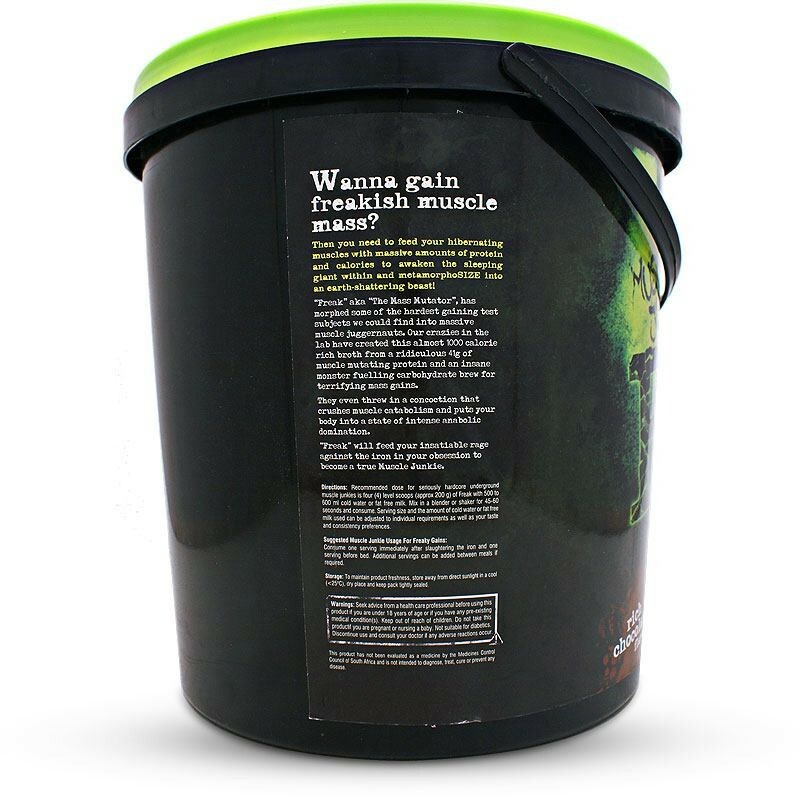 Muscle Junkie Freak is a well-formulated mass gainer which helps athletes supplement their daily nutrition requirements at a very attractive price per serving. 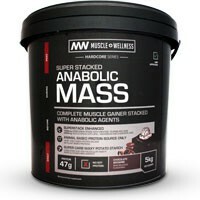 The amount of calories and protein per serving plus added ingredients such as HMB make this a definite for athletes looking for quality on a budget. Multi-Phase Carbohydrate Blend (Waxy Maize Starch, Maltodextrin, Dextrose, Fructose), Muscle Mutating Protein & Amino Acid Matrix (Ultra-Filtered Whey Protein, Calcium Caseinate, Egg Albumen, Soya Protein Isolate, Fat Free Dairy Solids, L-Glutamine, Taurine, L-Leucine, L-Valine, L-Isoleucine, L-Arginine Alpha-Ketoglutarate, Calcium HMB), Cocoa Powder, Flavouring, Xantham Gum (Thickener), Guar Gum (Thickener), Sodium Chloride, Vitamin Blend, Insulin Supporting Complex (Alpha Lipoic Acid, Chromium Picolinate), Sucralose (Non-Nutritive Sweetener). This product is made in a facility that uses edd, dairy, soy, wheat (gluten) and nuts. • Four (4) level scoops (approx 200 grams) with 500 to 600 ml cold water or fat free milk. • Mix in a blender or shaker for 45 – 60 seconds and drink. • Drink one serving immediately after slaughtering the iron and one serving before bed. • Additional servings can be added between meals if needed. • Serving size and the amount of cold water or fat free milk used can be adjusted to individual requirements as well as your taste. Seek advice from a health care professional before using this product if you are under 18 years of age or if you have any pre-existing medical condition(s). Keep out of reach of children. Do not take this product if you are pregnant or nursing a baby. Not suitable for diabetics. Discontinue use and consult your doctor if any adverse reactions occur. This product is fantastic. With a good workout program and diet I managed to gain +/-10kg in 3 months. The taste was a solid 12/10 I 100% recommend. The product is more fantastic. 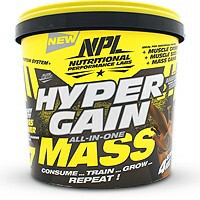 Gained 5KG from this stuff. Wow gained 6kg within a month.. I'v underestimated this freak..
Wow everybody z surprised about my gained weight within a month. Its a bomb. I really did not get used to the vanilla flavor taste,. Stopped using it but looking forward to trying again. Good, but not the best out there. Gained 4kg's in 3 weeks. Had a problem with mixing it as there would always be lumps in bottle after drinking. 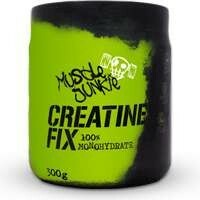 Best mix: 100ml level scoop with 500ml water. 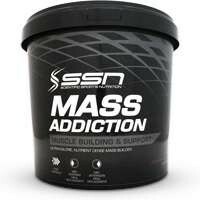 Made me gain 4kg in 2 weeks what a great product. I have been using it from 69kg to 73.5 in two months. Now I weight 79kg. This is very effective and I like the taste of strawberry. One of the better gainers out there. Taste is good (always can be better). Will keep using through winter.